Kingfisher Cottage - Country cottage in style of barn conversion with a sunny garden in a small village. Fully modernised while retaining features - fireplace, woodburner, exposed beams. Modern features inc underfloor heating (downstairs), CH radiators upstairs, double oven and ceramic hob, pressurised hot water. The garden provides a lovely setting to relax with a tranquil stream, sun loungers, BBQ, table/chairs, lawn (ideal for children). There are walks, historic houses, Jurassic coast and other places of interest within easy reach. With renowned pubs and restaurants in the area that provide something for everyone - from quaint to modern! With easy access to north coast (Somerset and Devon) and south coast (Jurassic coast of Dorset, Devon etc) and under one hour from Weymouth - site of Olympics 2012 sailing - there are sandy beaches, quiet coves, great walks and more! Bed 1 - King size double bed. En-suite with power shower. Bed 3 - 2 (3') full size single beds. Tim & Alison look forward to welcoming you to Kingfisher Cottage. We meet all our guests on your arrival and will do our best to ensure you have the perfect holiday! Do email or phone us if you would like any information or have any questions. The cottage has been in our family since built in 1997 and has been lovingly further modernised and updated in recent years. Fully modernised while retaining features such as fireplace, woodburner, exposed beams as well as oak stairs. Modern features inc underfloor heating (downstairs), CH radiators upstairs, double oven, ceramic hob, pressurised hot water, power showers etc. 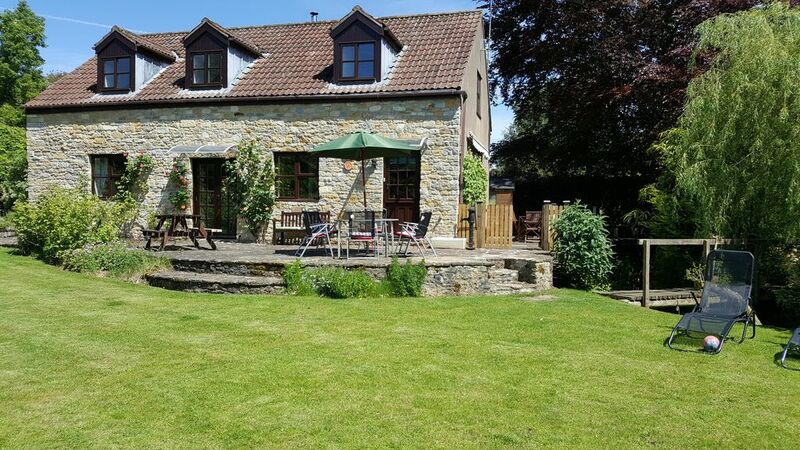 With 4 bedrooms and 3 bathrooms as well as large 'farmhouse' kitchen together with large lounge/dining room there is plenty of space for a great holiday. The garden provides a lovely setting to relax with a tranquil stream, sun loungers, BBQ, table/chairs, lawn (ideal for children) ..... The village has around 35 houses and a lovely church. The cottage is beautifully renovated to provide modern facilities while retaining all its charm. Chapel Cottage is located in a no through road with only 3 houses beyond - so with almost no traffic in the lane you can truly 'get away from it all'. Blackford has a lovely church and there are walks, historic houses, Jurassic coast and other places of interest within easy reach. There are renowned pubs and restaurants in the area that provide something for everyone - from quaint to modern! Lawn and garden to play in, relax and enjoy. Notes on accommodation: A well-behaved dog is allowed by prior arrangement. Strictly no smoking in the cottage. With stream sensible precautions should be taken with babies/toddlers. Dog or baby sitters often available by arrangement An online shopping delivery can be accepted on the day of your arrival by arrangement. Outside: The sunny garden is mostly laid out to lawns leading down to a tranquil stream. The stream is normally a few inches deep. Apple and other trees provide a wonderful country setting and shade - if required! In front of the cottage is a traditional stone patio facing onto the garden. Tables, chairs, sun loungers, parasols, gas and charcoal BBQs etc are all provided to make your stay a pleasure! With stream sensible precautions should be taken with babies/toddlers. There is driveway parking up to 3 cars and additional space nearby in the lane. Utility Room: Washing machine. Tumble dryer facilities Cleaning / Towels / Linen / Maid service: Towels & linen are included and will be changed on request after one week or between guests. Cleaning is also weekly on request and between guests. Other: French windows lead to the patio & garden from lounge. Back door from kitchen to patio & garden. Underfloor heating & exposed beams. Oak stairs. The owners were so accommodating they lent us a tie to replace the one we had forgotten ! We had a fantastic week,the weather was good ,the owner's were friendly and helpful ,the property was ideal for us ,very well maintained and equally well equipped,providing most things to make our stay enjoyable and relaxing. This is a superb cottage, very well equipped. Slightly out of the way but that’s what we wanted, peace and quiet other than the birds! We were made up of two families with young children and the cottage is big enough for everyone to have their own space while plenty of space in or out to come together. We just got back after spending a lovely weekend at the Kingfisher Cottage. Everything was perfect, lots of room for the family and there was so much in the cottage itself to keep the 4 kids entertained. We arrived around 9pm on the day of our checkin and Tim & Alison were kind enough to receive our grocery delivery, this helped especially as we had 4 kids under the age of 10. Thanks Vikram. We enjoyed hosting you all and you will be welcome back in the future! Excellent property, spacious, very comfortable, all facilities available and working, owners available if needed. Great location for local walks plus good base for trips further afield e.g. Wells, Stonehenge, Shaftesbury etc plus excellent attractions at Fleet Air Arm Museum and Haynes Motor Museum for a rainy day. A large, well laid out and we'll equipped property. Tim and Alison have done their very best to ensure that you have an enjoyable stay and that all of your needs are catered for. With easy access to north coast (Somerset & Devon) & south coast (Jurassic coast of Dorset, Devon etc) and under one hour driving from Weymouth - site of Olympics 2012 sailing - there are sandy beaches, quiet coves, great walks and more! Includes Lyme Regis, Lulworth Cove, Studland, West Bay, Weston Super Mare, etc. Along the Jurassic coast you can look for fossils, go rock pooling, paddling and swimming. Boat trips & Channel Islands (Guernsey or Jersey) – Condor Seacat runs from Weymouth. Ferries from Poole, Weymouth. Trains from London Paddington to Castle Cary & Waterloo to Sherborne. Within 60 mins: Bath and Bristol. Salisbury and the Cranborne Chase. Cheddar Gorge. Stonehenge. Wookey Hole and Cheddar Caves Dorchester. The Tank Museum, Abbotsbury Swannery. Monkey World. Cycle Routes & Walks: Alfreds Tower (folly, wooded, superb views). Camelot (Ancient Hill Fort at South Cadbury). Ham Hill. Leland Trail (and cycle route). Somerset Levels. Somerset website (various walks/cycle routes). Local good food pubs: Camelot, 2m, South Cadbury. Kings Arms, 2m, Charlton Horethorne. Mitre Inn, 6m, Sandford Orcas. Montague Inn, 4m, Shepton Montague. The Old Inn, 2m, Holton. Queens Arms, 3m, Corton Denham. Red Lion, 8m, Babcary . Stapleton Arms, 7m, Buckhorn Weston. Stags Head, 3m, Yarlington . Local Restaurants: At The Chapel, 7m, Bruton. Capozzolis, 10m, Ilchester. The Green, 7m, Sherborne. Little Barwick House, 9m, Barwick. Paprika Indian Restaurant, 7m, Sherborne. Plumber Manor, 15m, Sturminster Newton. Rajpoot Tandoori, 7m, Sherborne.